In this article, Dr. Frederiksen provides five strategies that firms need to implement to firm up or develop their referral marketing strategy and thrive in 2017. Referrals are widely seen as the most dependable and direct path to new business. Small wonder that, according to a study conducted last year by the Hinge Research Institute, almost 62% of firms see increasing referrals as a key goal. As you work on next year’s marketing plan, consider beefing up its referral marketing section. Here are the five most impactful, strategic elements to include—tactics that will help you not only get more referrals, but also keep the referrals you get. 1. Showcase success stories about your most significant projects. First, make sure your descriptions of relevant projects are up-to-date and impactful. In particular, they should emphasize the unique expertise and insights that you brought to bear on each task and if possible, quantify the results. Second, share these stories (or links to them) on every relevant platform or channel, including your website, social media, press releases, newsletters, and so on. This strategy has the added benefit of ensuring that potential clients can get a quick understanding of how you can help them. 2. Get your experts talking at conferences and trade shows. High-profile experts are extremely effective at drawing in referrals, especially when they speak at events that attract a significant number of prospects or influencers. Speaking opportunities at trade shows can be especially fruitful because they attract large numbers of professionals from a specific industry, allowing you to expose your in-house experts to a highly strategic audience. 3. Allocate resources to ensure a high-quality, professional website. Consider two sobering statistics. First, more than 80% of prospective clients check out a firm’s website before deciding whether to hire them. Second, 52% of the people referred to firms never actually follow through by contacting them—chiefly because they were not sure exactly how the firm could help them. 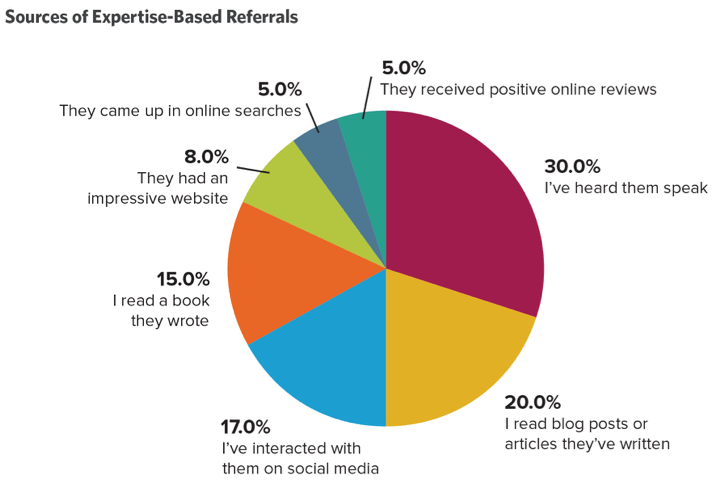 As shown in the pie chart below, a high-quality website can be a source of referrals in its own right, with as many as one in three expertise-related referrals succeeding based on websites that impressed clients, ranked high in searches, or contained good content. 4. Create and share educational content that is high-quality and relevant. A solid website requires solid content, which can be in the form of blog posts, white papers, executive guides, articles, webinars, etc. The key is to develop this content around themes or issues that you know are relevant to your prospective clients. Offering such content is a sure-fire way to demonstrate your firm’s expertise—and managed correctly, it is also a way to help draw in prospective clients through content marketing. 5. Share insights that your target market has not heard before. Organizations want to work with firms that are not only up-to-date on issues that affect their industry—but preferably, that also drive the field forward. To convey this type of thought leadership, you need to go beyond repeating other experts’ consensus. For example, you can also share new insights about the industry, and one of the best ways to do so is to conduct original research, which you can use to provide prospects with fresh insights. Keep in mind, even the best referral marketing plan will produce no results until it is implemented. Far too often, organizations start with good intentions and ambitious schedules—only to encounter headwinds or disinterest in a matter of weeks. Until your people understand the real impact that referral marketing can have on generating new business, they may feel their time and efforts are better spent elsewhere. 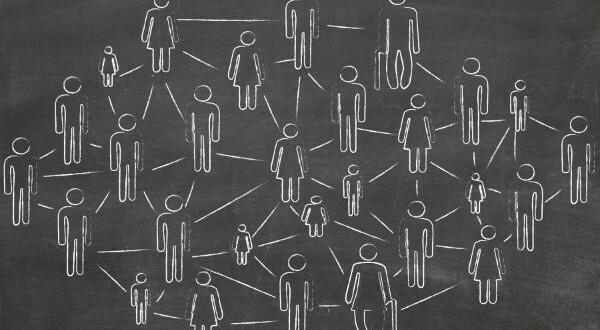 The key is to recognize that contrary to the old way of thinking, referrals are not free. If you want to maximize your ability to attract and keep referrals, you need to stand out in the crowd—and that requires investing in a referral marketing strategy that is sustainable for the long term.